Lina Almuallem brought in a tray of coffee as she talked with Jessica Bueler on the day she was preparing homemade Syrian cuisine in her kitchen in Mapelwood on April 22. When Lina Almuallem fled war-torn Syria in 2012 with her husband and three children she knew no English, had no friends and didn’t know how to drive. Now she speaks English well, learned to drive and has a job sewing for a costume company. Her family moved from a troubled apartment complex to a well-maintained apartment building in a thriving area of Maplewood. “When I came to America, everything was hard,” said Almuallem. But she met visitors from Welcome Neighbor STL and “everything changed. Many people came and helped, and now they’re family,” she said. When Almuallem’s husband, Yasser Sakroujeh, was forced to join the Syrian military, they left for the safety of Jordan, where they lived for four years and barely eked out a living in the underground economy. The International Organization for Migration and UNICEF agreed to resettle them in another country. When the U.S. embassy called to tell them they would be accepted into the United States, Sakroujeh, who worked as a barber in Syria, cried with joy. “America!” he remembers shouting, so excited to go to his choice as the best possible country to resettle. Welcome Neighbor STL wasn’t even a concept when Jessica Bueler knocked on the doors of Syrian families, offering toiletries and winter clothing and asking how she could help them. Bueler wanted to help after she came across a news report about attacks on teens from refugee families and the substandard living conditions of the apartment complex on Hodiamont Avenue in St. Louis where they had been resettled. 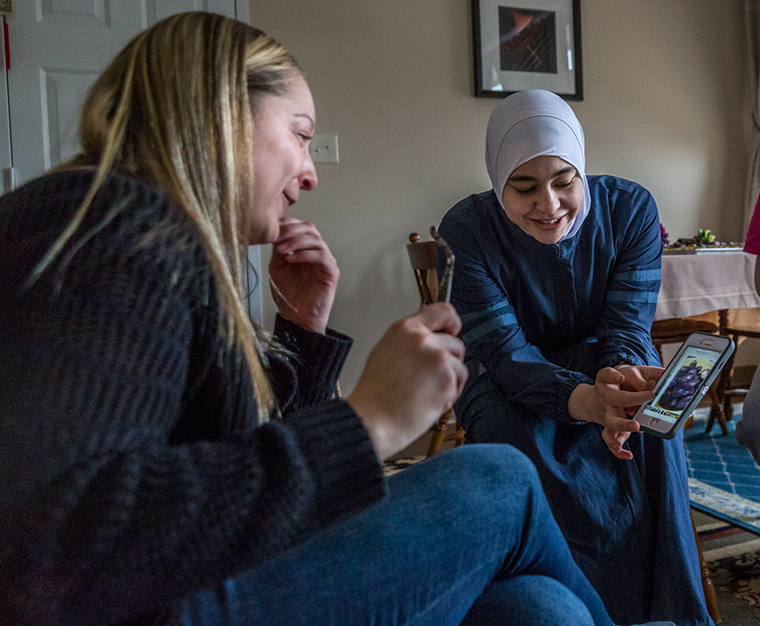 Lina Almuallem, center, showed pictures to Jessica Bueler on the day Almuallem was preparing homemade Syrian cuisine in her kitchen in Mapelwood. Bueler helped found Welcome Neighbor STL, a grassroots community support group that assists with English tutoring, helps families move from substandard housing, provides household items to those who need them and more. One of the biggest needs for the families was for someone to read and explain the messages in their mail. By doing so, Bueler learned that some of the children had high levels of lead in their blood and needed treatment. Volunteers partnered with families, tutoring began, toiletry drives were conducted and the Supper Club concept began. The organization is growing rapidly. The Supper Clubs are conducted in homes, churches and elsewhere as a fundraiser for refugee families. 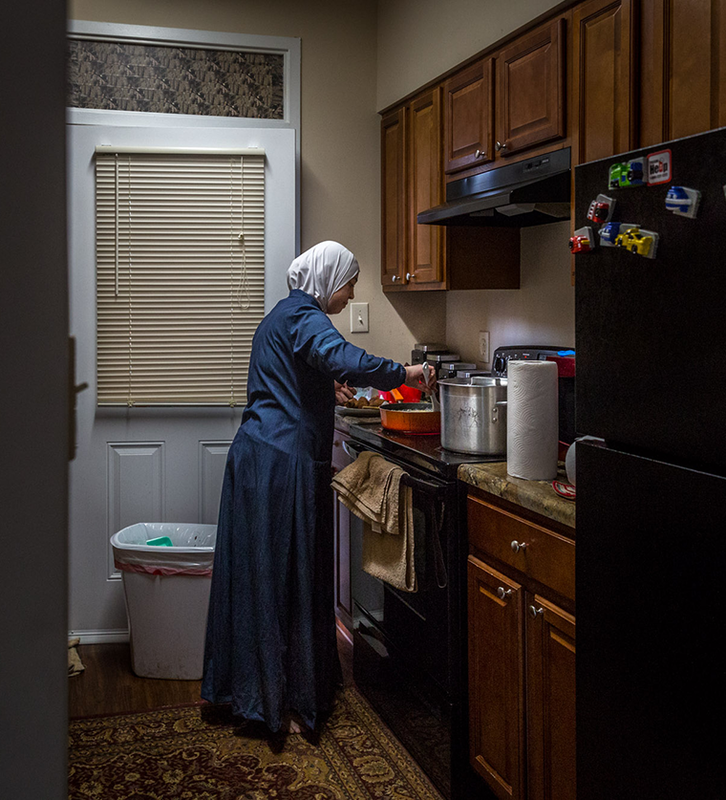 Lina Almuallem prepared homemade Syrian cuisine in her kitchen in Mapelwood. Welcome Neighbor’s twice-week English as a Second Language classes are taught by a volunteer teacher in donated space at Grace United Methodist Church for 18 women. The program, now with about 40 volunteers, provides rides and child care. With help from funds raised by the organization, most of the Syrian families have moved from the substandard apartments. Some cultural differences exist with the Muslim refugees, but they’ve easily worked through those. Women typically aren’t entrepreneurial in Syria, so Welcome Neighbor meets with them to discuss the process. “It’s just a way of helping our friends feel welcome and to help educate,” Bueler said. Almuallem’s English is proficient, and she and her husband, both outgoing and happy individuals, take every opportunity to talk to people. Their children, ages 6, 9 and 11, are thriving. “I have many friends,” Almuallem said.